An Atomic Blimp in a prerelease GTA V screenshot. 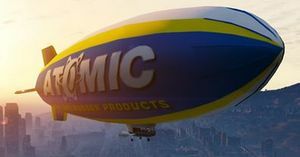 The Atomic Blimp is a blimp featured in Grand Theft Auto V. Featuring the branding of tire company Atomic, the blimp is based on the Goodyear Blimp. The blimp will be operable to owners who have pre-ordered the game. It will likely also appear in non-pre-ordered versions of the game, but be inoperable. This page was last modified on 6 October 2013, at 06:43.